I have been banished from the City Centre by my editor again this week and sent to the rolling moorlands of Pudsey. I think he’s a bit worried that the bright lights and fleshpots of Leeds on a Thursday lunchtime might just turn the head of a young innocent lad like myself. Excuse me for a moment whilst I move my chair a bit farther away from the computer screen as my nose has inexplicably begun to grow at an alarming rate. Feed straddles the Pudsey/Stanningley border on Richardshaw Lane, just down the hill from the motorway junction with the Ring Road. It is a bar, restaurant and coffee shop owned by the people behind Leeds establishments Aperitivo and Vice and Virtue, both of which I have had the pleasure of visiting and are dining at its best, so I was looking forward to giving it the once-over. On arrival I was shown to a table and immediately provided with an unsolicited glass of water, which was a nice touch. They do not do a lunch menu as such,except on Sundays, but there is a brunch served from 8.00am until 4.00pm. I was a little disappointed to see that the bias is towards the breakfast part of brunch rather than the lunch bit. I asked whether there were any daily specials and was told that today it was Wedge Salad. I resolved to stick with the printed bill of fare, ordering Feed Benedict at £9.00. 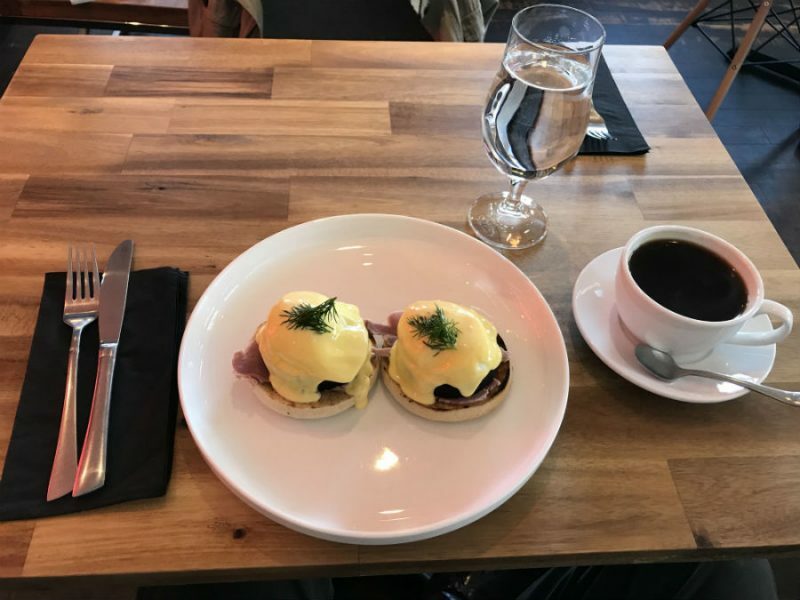 This was, unsurprisingly, a twist on the old breakfast staple of Eggs Benedict, i.e poached eggs and roasted ham on toasted muffin, bathed in Hollandaise sauce, but given the addition of black pudding with a garnish of dill. All of the components were of the highest order and combined to give a comforting feeling on a sunny, but chilly day. 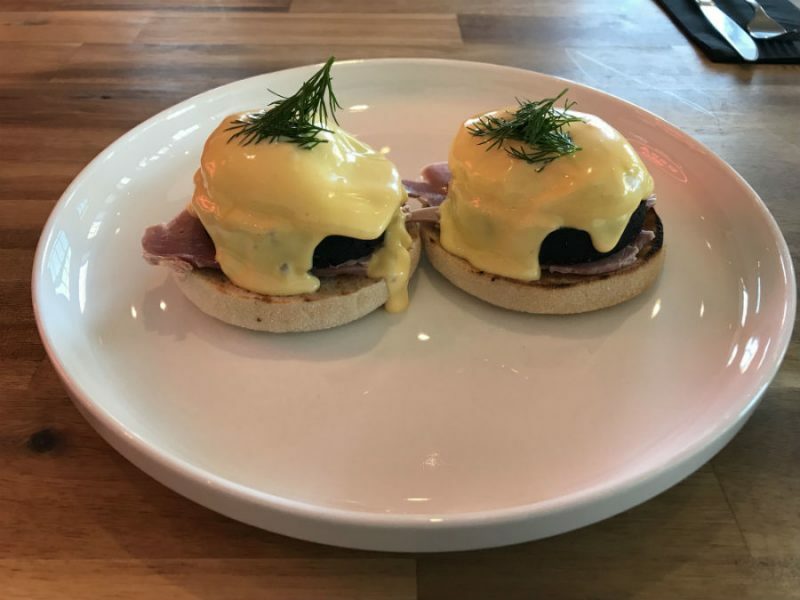 The hollandaise sauce was beautifully silky and of the perfect consistency, runny but not so much so that it ran off the food and onto the plate; it just coated the eggs and black pudding which is what it is there for, as well as to add flavour of course, which again it did. Eggs Benedict always tickles me as it must be one of the few dishes to be covered in a sauce made from the same ingredient as the food it covers, eggs and butter, but it works superbly and it provides you with the added entertainment of being able to sit and listen to your arteries harden, but least being a breakfast dish you can walk the effect away during the rest of the day. The black pudding was also amazing, being perfectly seasoned, beautifully soft and yielding. The bar serves various drinks all day, including cocktails, but I decided that I would stick to the coffee about which the website makes great claims, and ordered an Americano at £2.25. This was the only slightly disappointing element of lunch. I drink my coffee black with no sugar so there are no other flavours to hide behind. Sadly this brew was a fair bit more ‘mellow’ than I would have liked, having no real kick to it. 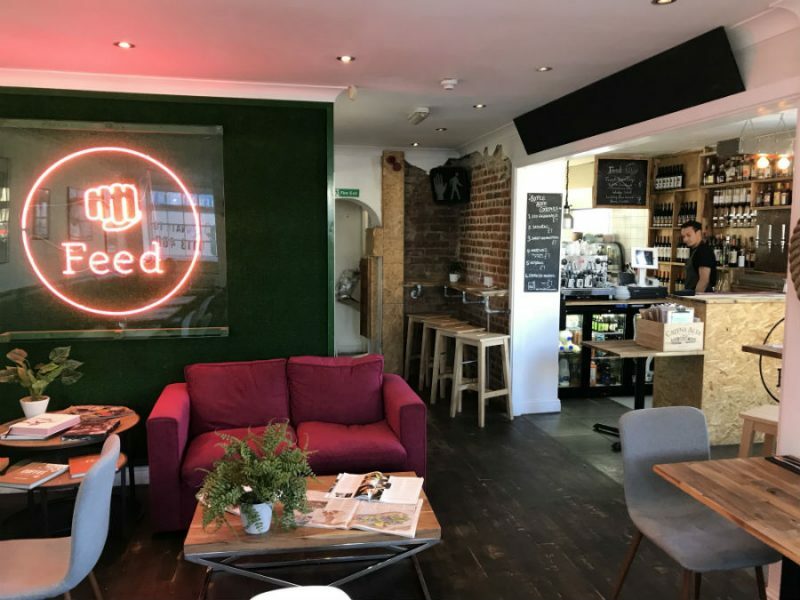 It was not enough to spoil the overall impression of the meal and I can heartily recommend Feed, but hope that they are able to extend their brunch offering to include more choice of lunch-type dishes. I am sure that Feed will become an integral part of the Pudsey social scene, even though it is a little way out of the town centre, as in addition to delicious all-day fare, they serve very inventive small plate meals from 5.00pm each day as well as the aforementioned drinks and cocktails.